In the world of interior decorating, paint color is a constant topic of conversation, speculation and new trends. While attention has typically been given to choosing the right wall color, I’ve noticed a shift toward a new focus on trim color. Here’s a look at some of the trim trends we’re seeing. In this spread from HGTV Magazine, the owners chose to paint their walls and trim a statement-making blue. Imagine how different the space would feel if the window trim had been white instead. In this page from the latest Serena & Lily catalog, the entire wall paneling is painted one light blue tone. This homeowner chose to paint all the window trim, door frames, and baseboards black (image via Remodelaholic, via Apartment Therapy). This image from Serena & Lily shows the power of black trim against an otherwise all-white room. This bright yellow window trim adds just the right punch of energy to this room. 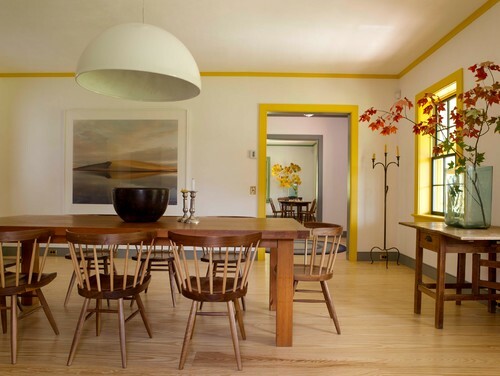 Another happy example of yellow trim in a farmhouse dining room. What do you think? If you’re afraid to paint an entire wall a different color, why not try just the trim? It’s December, so that means it’s time for paint companies, designers and fashionistas to declare their “colors of the year.” The Pantone Color Institute is considered to be the leader in these predictions, and for 2016 they’ve made an interesting choice—a blend of two colors, Rose Quartz and Serenity. We have seen pink as a major color trend for a while now, and this periwinkle blue is a new twist on the soft blues that have been popular (remember “Breath of Fresh Air” from Benjamin Moore 2014?). It’s helpful to look at the whole palette of colors that Pantone provides to see how to use Rose Quartz and Serenity in your home (without making it look like a nursery). In our own decorating and staging projects, we find it easiest to use pink as an accent color, as we just did in this Oakland home for sale. The pink is limited to the artwork, one pillow and a vintage stool. We love how pink interacts with black, white and gray. It’s interesting to note that while Benjamin Moore has chosen Simply White as their own 2016 Color of the Year, the palette they selected to complement Simply White also includes a light pink (Cream Puff) and a periwinkle blue (Enchanted). What do you think? Do you (or will you) use pink or periwinkle in your own home?